Heat 2 tablespoons in skillet over medium heat. Add ramps and season with salt and pepper. Cook just until ramps take on some color. Add about 2 tablespoons water, cover and let steam until ramps are sod and tender, about 3 minutes. Remove ramps from pan and transfer to a plate. Meanwhile bring a small skillet filled with water to a boil and poach eggs to desired runny/firm state. With eggs poaching, wipe out ramp skillet, add butter and melt over medium heat. Add capers and breadcrumbs and cook until golden. Douse with lemon juice and sauté to crisp. 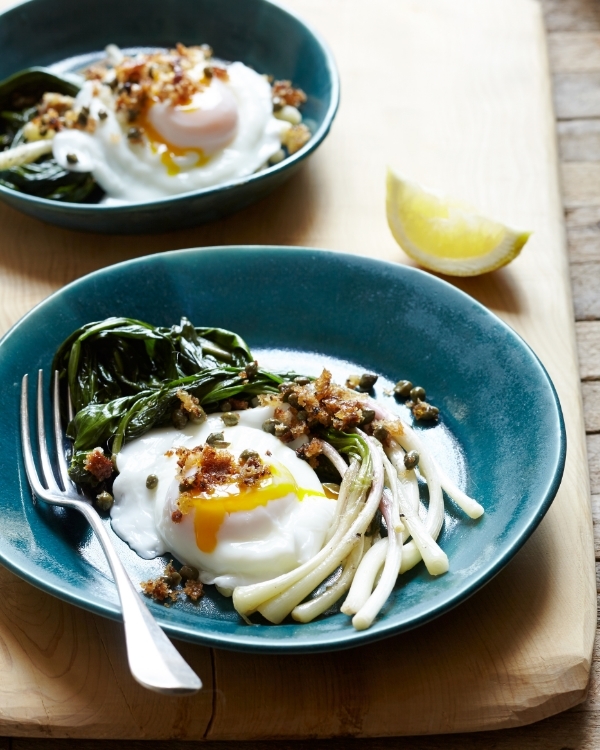 Divide ramps and eggs between serving plates. Sprinkle with bread crumb mixture. Season with more salt and pepper as needed.